President Nicolas Sarkozy appeared a little embarrassed today after declaring yesterday "Rue de Day" or "Street Day" in France. 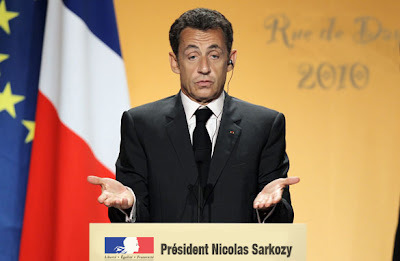 In an impromptu interview, Sarkozy explained, "I had heard about this PJM fellow who was calling for what sounded like 'rue de day.' I mistook PJM as slang for the word 'pajamas' and assumed he must be a talented new comedian calling for what I thought was a street day or festival. You have to understand, it was an honest mistake. Any normal person who has heard of his proposal for reaching the poles with wind powered sledges ...and that slapstick routine on his roof. I mean, seriously, I haven't seen anyone this funny since watching Jerry Lewis as a boy!" Later he commented, "You know these mistakes wouldn't happen if French were the Lingua Franca." The crowds in the capital city were noticeably saddened by the sudden cancelation of "Rue de Day." One frowning street performer was quoted as saying, "..." as he released an imaginary balloon into the sky before waving goodbye and pretending to cry. While "Rue de Day" may have been cancelled, Villain Fashion is the order of the day on the Paris runways as evidenced by Prada's latest offerings. Spokeswoman Alessandra Ghezzi remarked, "Before now, styles have only allowed one to feel villainous. This season a woman can feel super villainous!" In related news, Hollywood insiders tell us that production companies are now in a race to be the first to release a film on Super Villain PJM. "Everyone loves a bad boy and you don't get anyone badder than this," announced an excited studio exec. Meanwhile Anthony Hopkins has reportedly turned down the PJM role at the same studio stating, "Playing Hannibal Lechter gave me nightmares for months. I can't imagine what playing a real villain would be like!" Casting agencies are reportedly working overtime to find anyone handsome enough to play the role of hero Nate Maas. Back in the United States, Speaker Pelosi, announced plans to unveil the largest bailout to date to prop up America's nascent wind sledge industry. I can see your fashionista wife in one of those dresses. I may have to side with The League of Super Villains if I can get me some of that fashion!